Over the last few years, women the world over have been trading in their relaxers for a more natural look. And with any change in taste, comes opportunity. Carol’s Daughter, the natural hair and beauty product company, estimates that the market for relaxers has gone from bringing in $100 million a year in sales to just $35 million. Taking advantage of such a steep decline in market share, Carol’s Daughter and other companies have created products that cater to more diverse hair textures and styles. But while beauty store shelves were being flooded with natural hair care products, no one seemed to be thinking about educating women on how to discover and use these products. No one besides Myleik Teele, that is. 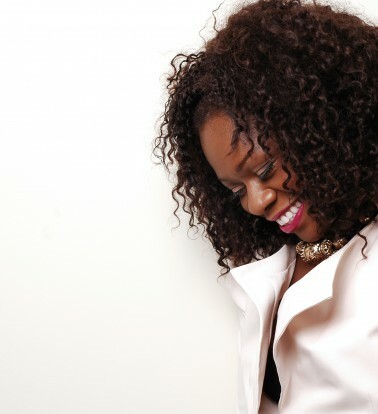 Here, Teele talks about how she launched curlBOX (her second business! ), beauty industry obstacles and provides advice for other aspiring entrepreneurs. H+S: Let’s get this out of the way first. Are you natural? If not, do you think you have to have natural hair to understand this sector of the beauty industry? 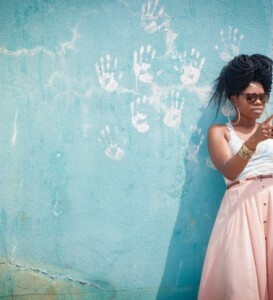 Teele: Yes, I’ve been “natural” or without a chemical relaxer for a little over a decade. I think it’s important , although not necessary, that one be natural to really understand what the subscribers are experiencing and having my finger on the pulse of what they want and need. I’m “pre-pooing,” and finger-detangling right along with my VIP members. H+S: In a recent interview with UPTOWN magazine you said that you noticed a void in the beauty industry. Can you talk more about your epiphany moment and how you knew it was the right time for this type of product? Teele: After working with my beauty clients and going to the World Natural Hair Show and other shows and hair “meet ups” I had an epiphany moment. How would it be possible to package or “BOX” this experience (products & information) and send it to someone’s doorstep? The idea hit me and wouldn’t leave. I couldn’t even sleep at night with the thought on my mind. I took one step and the rest is history. H+S: curlBOX seems to have been modeled after other beauty related mail-order subscription services. What made you go this route instead of launching your own natural hair product? Teele: My expertise lends itself to this business model. Mail-order subscription services have been around for years – remember Columbia House CD Clubs? I’m a “what’s the latest and greatest” kind of girl and I genuinely believe that I can better serve the hair community with a sampling service as opposed to another product … I’ll leave that to the experts! H+S: How did you decide which companies to partner with for curlBOX? Teele: [Member feedback and research]. I am a product junkie at my core and beauty obsessed so I’m always on the blogs and watching YouTube videos. I also read the emails and take a look at the survey results and work from there. You won’t see any products in curlBOX that aren’t personally endorsed by me. H+S: When you first made your pitch, were product companies receptive? Or, did you experience resistance? Teele: Some brands like Karen’s Body Beautiful, Frizoff Curly Hair Solutions and Hair Rules got it right away and there were some that wanted to watch the brand for awhile which is completely understandable. H+S: How did you come up with the $20 price point for monthly subscriptions? Teele: I came up with the price point by examining the market and running the numbers. When you receive a curlBOX you receive a gift. curlBOX is a premium service and honestly, our subscribers simply expect more from us. Our boxes also have a high-value – the premiere curlBOX had an item in it worth $21. So members are definitely getting their money’s worth. H+S: Does curlBOX have different levels of membership? Are their any VIP options? Teele: There are no regular members at curlBOX. All of our members are VIP. We also have a newsletter that’s free to those who aren’t members yet and we’re always doing fun things for them. We have contests, giveaways and even exclusive coupons that you can only get if you’re on our mailing list. H+S: How are you handling the demand? Does curlBOX have a waiting list? H+S: Was curlBOX designed for lifetime memberships? Or, do you think that once subscribers get a feel for what products work best for their hair, they’ll drop off the list. Teele: I always say that I’m not even sure that I’d be a lifetime member. You get a LOT of stuff. Some people can’t work through the boxes fast enough to stay on long term and what’s fun about that is that they give someone else a chance to get on the list and try new things. Some have emailed that after 3 months they’ve found ALL of the products that work perfectly for them. That’s victory for me! That’s the goal … I just want to help you find what works BEST for you and whether you get it within a month or years of curlBOX is alright with me. Teele: Yes. The business is doing very well. H+S: Did you get an investor before launch? If not, are you considering going that route now? Teele: I didn’t have a financial investor but I did receive intangible investments by way of a business advisor. I haven’t really thought about financial investors at this point. H+S: What has been the biggest lesson you’ve learned since launching curlBOX? Teele: The biggest lesson I learned since starting this company was what to focus on. As a PR person I was focused on how it looked and what people thought of it as opposed to the actual logistics. In order to run a company like this you have to understand things like shipping, storage and customer service – the non-glamorous side of the business. I had to stop deeply obsessing over the Pantone colors (trust me I can GO there) and focus on my business. H+S: What has been your biggest regret? Teele: I don’t live a life of regrets … I don’t believe in right or wrong decisions. I believe in good and bad consequences. There are no regrets. H+S: Do you have a mentor or someone that you turn to for advice? Teele: Yes, I have several mentors. No one ever gets successful on their own. One of my mentors is Tresa Sanders of TreMedia. She has been a big sister and huge supporter of my curlBOX dream. She leads by example and I’ve never seen anyone that has mastered the human connection like she has. H+S: Who/what is your biggest inspiration? Teele: My biggest inspiration for curlBOX is one of my best friends, Ken Burkeen, (former P&G exec) founder and CEO of Huetiful (hair steamers). Ken has not only been an incredible friend to me but he exposed me to a new and better way of thinking about business. I learned that it was less about me and more about the customer. As a PR professional it’s all about the aesthetics and taste – things I like and just the way I like it. Ken encouraged me to think differently which completely changed the way I do business. H+S: What advice would you give someone looking to break into the beauty industry? Teele: In every industry, you should seek to solve problems as opposed to seeking money. Look for gaps. Try to find new and better ways of doing things. The beauty industry is always on a mission for the latest and greatest … Become that. H+S: curlBOX isn’t your first business venture. You’re also the owner of a PR firm. What made you want to start another business? Teele: I started another business because I noticed a serious need in the market and wanted to challenge myself personally and professionally. H+S: Did having a previous business make launching the second one any easier? Teele: Yes. Having a business that not only survived a recession but also succeeded removed a lot of the fear that I probably would have had. If I did it once perhaps I could do it again. H+S: You recently mentioned that you just resigned all of your firms’ client accounts. What was the catalyst for that decision? 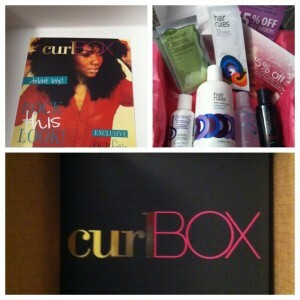 Teele: After two months in business, curlBOX began to demand my attention. The increased awareness and demand for the service brought me to the crossroad of making a decision a lot faster than I ever imagined. I decided that it wouldn’t be fair to my clients to not give them the attention they deserved. H+S: As someone with a PR background, what advice would you give a solo entrepreneur who is responsible for generating buzz for their start-up? Teele: Having a PR background gives me a clear understanding of the value of relationships. Buzz always starts with a good product or service and then who says it “great” and how much influence they have. Work on building authentically solid relationships. H+S: There has been some talk within the natural hair community about new services that are similar to curlBOX. Do you feel threatened by that? Or, is it validation that you’re on to something? Teele: Competition in any market place is great for the market. At this time, there is nothing on the market that provides the quality and value that curlBOX does. I don’t believe that there are any other brands that bring the level of service and products to our members like we do – our service is unparalleled. H+S: curlBOX has grown so much in such a short amount of time. Where do you see the business in one year? Five years? Teele: At the end of the year my goal for curlBOX is to be established as the premiere service for curly hair while continuing to build awareness. In five years I hope to have established a brand that is the center of brown beauty conversations. H+S: Can you give us a hint at what natural hair lovers can expect from curlBOX in the near future? Teele: Members can expect tons of surprises from some of their favorite brand and from some that they’ve been eyeing for a long time and simply haven’t gotten around to trying. We also plan on visiting many cities for some one-on-one time with our members.